The German Pinscher, also called the Standard Pinscher, is a medium-sized, tall terrier. The German Pinscher was officially recognized in Germany in 1879 and has been protected and promoted since 1894 by the German Pinscher Schnauzer Club. During the years around the turn of the century, both smooth pinscher and coarse-haired schnauzer pups appeared in the same litters. The club initiated a policy requiring proof of three generations of pure smooth coats for registration. This quickly helped set type and made them a distinct breed from the Schnauzer. 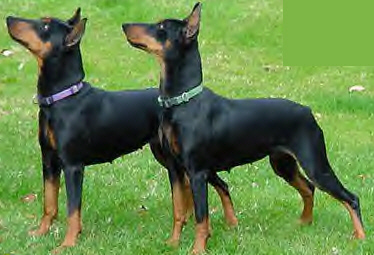 The German Pinscher played a role in the development of the Doberman and the Miniature Pinscher. It has been used on farms as a vermin destroyer, herding livestock, watchdog, guard dog and family pet. •	The German Pinscher is an ideal companion dog. •	Not squeamish, sober, and has considerable stamina. •	It is lively but docile, quite versatile. •	A vocal guard dog. •	It responds well to obedience training. •	This breed only barks when it feels it is necessary, which may be often. •	Like other pinschers and terriers, this breed does not back away from dominance challenges with other dogs. •	Very loyal and protective. •	Will defend their territory, handler, and the family to the end against those intent upon harm. chase a cat, possibly hurting it. •	The strong, smooth, glossy coat requires little grooming. •	An occasional brushing to remove dead hair is all that is needed. •	This breed is an average shedder. The German Pinschers are loyal, lovable and playful dogs that truly enjoys being with the family. They are a great dog with older children but due to their smaller size and terrier temperament they are not recommended for houses with very small kids that may tease or play rough with the dog. Despite being a terrier and a natural hunter and ratter, the German Pinscher is much more people oriented than most terriers. They are calm and sedate in the house and love to be in the center of the action without being hyperactive or demanding of attention. The German Pinscher has a natural playful streak that makes them and ideal family dog and companion. Highly intelligent, they are generally easy to train but may be somewhat stubborn and strong willed at times. Like most Pinschers, the German Pinscher is a natural watchdog and a good guard dog even though they are small in physical size. They have a tendency to bark at strangers and will protect what they deem to be their own space and property. Some German Pinschers may become very possessive of their food and toys, so training must start with regards to establishing the human as the "alpha dog" from a young age. The German Pinscher can be dominant with other dogs but with early socialization is a great companion dog for other canines and even cats. Since they are a ratter by nature, they are not suited to homes with small rodent pets. The German Pinscher has been carefully bred and is not prone to many of the genetic conditions that are found in many of the terrier and Pinscher breeds. attention from owners. Grooming the German Pinscher is very easy but does require a routine to remove old, dead hair from the coat. A grooming glove or a soft bristle brush is ideal to remove the hair and keep the coat shiny and healthy. Only bathe the dog when necessary and use specially formulated dog shampoo and conditioner. Over bathing can result in a dry, brittle coat and may lead to skin problems such as hot spots and irritated patches of skin. Grooming should also include checking the nails and clipping as necessary. The eyes, ears and teeth should also be cleaned and checked on a regular basis. The German Pinscher is a playful and energetic dog that does require moderate amounts of time outside in a fenced yard or longer, brisk walks at least once and ideally two or three times a day. They will be rather sedate in the house however they can resort to chewing and destructive behaviors if kept confined or isolated in small spaces for too long. The German Pinscher is naturally very athletic and makes an excellent jogging or hiking companion. They love to get out and run, but due to their terrier nature they will often chase and not return on command, so a high, secure fence or a long lead is highly recommended. These dogs can jump as well as climb and they love a challenge when it comes to physical activity. This little Pinscher will excel at dog sports such as Frisbee, Flyball and fetch as well as games such as hide and seek. Since they do have a tendency to be somewhat dominant games of strength such as tug of war or rough play is not recommended, especially when younger children are involved simply because the dog may respond more aggressively than normal in these types of situations.